Welcome to the beehive, where there’s enough free spin bonuses and honey a bee can ask for. Beez Kneez is an entertaining 5 reel slot with a magnificent 25 paylines that will have you buzzing with joy. Looking for new exciting games? view these new slots online today! Not many online game devs can hold a candle to the acumen of a company like Eyecon. The quality of games they produce coupled with their overall mentality when it comes to user experiences separate them from the pack. Their games can leave you in a lull of excitement unlike anything ever experienced before, that’s just the kind of company they are. You can learn more about online slots games about Eyecon anytime. Imagine what kind of adventures you could have as a bee. You could fly around all day and enjoy all the honey you desire. Well, daydream no more because Eyecon has you covered with their new online slot title: Beez Kneez. This slot is a 5x3 game with around 25 pay-lines to help increase those winnings. 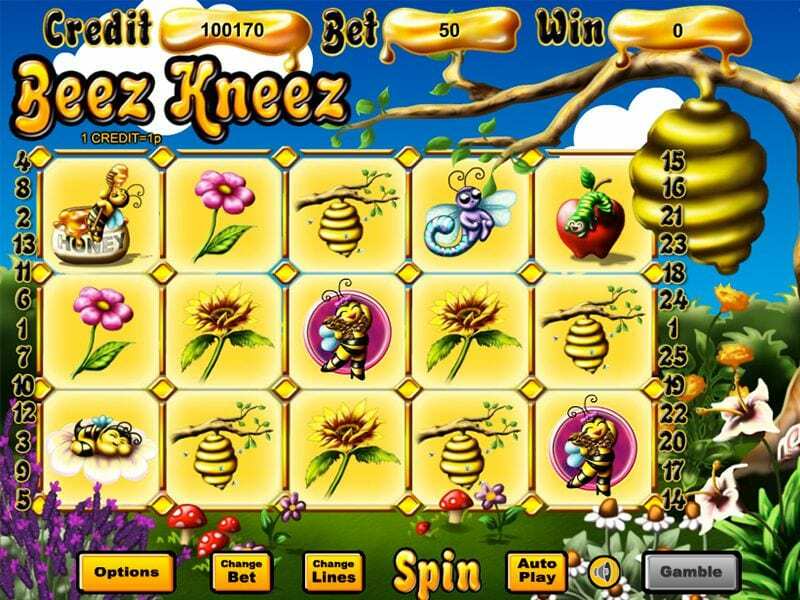 Beez Kneez is a 5 reel slot with 3 rows and up to 25 paylines. The game takes place in what feels like a field, the skies are blue and it feels like there is not a care in the world. Ahhh bliss. So buckle up, and experience the best video slots to play today. The symbols in Beez Kneez also carry the happy go lucky theme with symbols taking the shape of butterflies, flowers, apples, mushrooms and beehives. Look out for blue cocoons as these symbols are the games scatter, which matched can completely change the game per round. Not only is Beez Kneez a fun slot to play as it is, but there are also bonus features that can be unlocked through the gameplay. The ‘Worker Bee Prize Pick’ is but one of these features. Landing 3 or more of the worker bee scatters will trigger this mode. Once triggered you will be taken to a separate screen displaying a series of pink flowers in a basic arrangement. Selecting the same number as that of the trigger symbols will have the chance to multiply your potential earnings by 100x for each pink flower picked. Free spins make a welcome addition to Beez Kneez also. To trigger the free spins the player must match together a series of wild cocoon symbols anywhere on the board. Three cocoons will give the player 15 free spins, four will grant 20 free spins and five will give the max of 25. But wait, there’s more! During the spins, all prizes will be subject to a 3x multiplier and it’s also possible to retrigger the spins by landing 3 or more wild cocoon symbols, so the more you play the more you win! Simple. Been Kneez also has a gamble feature where each win can be possibly gambled for a much higher payout. Activate this mode by clicking on the ‘Gamble’ button at the bottom of the screen. This mode can be a little hard on players who have gone into this mode with a pretty high stake, to begin with, so think cautiously before choosing this option.